I’m back in the States for a couple of weeks to visit schools in Texas and Arkansas and speak at Harding University. Hi, my name is Mandy, and I’m a huge fan of your books. It’s Christmas Eve in my time zone right now. A few hours ago, my family was eating dinner at my aunt’s house, and I got my copy of Tentacles. I finished it five minutes ago. WOW!! I really, really loved it, and could not put it down. Dr. Noah Blackwood is very high up on my list of favorite literary villains. And I love how you always stress the strength of Grace and Marty’s relationship, even after they found out they weren’t really twins. Now for the questions. I want to be a writer. Do you have any advice? I like doing writing events like NaNoWriMo (National Novel Writing Month). How do improve your writing? I know you probably get a lot of letters and emails like this, but I want to learn as much as I can from whoever I can. Final questions, I promise. How many more books are there going to be in the Cryptid Hunters series? Are you writing the next one right now? How much longer will it be until the next book comes out? What will the title be? What cryptids will they find? Will Blackwood and/or Butch get punched in the face by Grace and/or Wolfe at least once? I\’m a book-crazy fool, as you can probably tell. I don’t honestly expect answers to most of my questions, but I would be really thrilled if you would reply. Thanks a bunch, and Merry Christmas! Or Happy Holidays, if I need to be politically correct. Writing isn’t difficult, but it takes thousands of hours of practice to get good at it. Because of this you need to start writing right now everyday for the rest of your life. Being a writer is not an activity, it’s a way of life. My day is planned around when and how I’m going to get my writing done that day. Some days I write more than I do on other days because of my schedule, but a day doesn’t go by when I don’t write something. 10 minutes is better than none. How do improve your writing? By writing of course. But also by reading. I read 2 or 3 books a week and I’ve done this for over 40 years. I learn a lot about writing by studying how other writer’s write their books. Also, you need to give yourself permission to write badly. The great thing about writing is that you have the chance to go back and change what you’ve written and make it better. This is call revision. Everytime you change something in your story you’re writing gets better. Some people think revision is a curse. It’s actually a blessing. How many more books are there going to be in the Cryptid Hunters series? I don’t know at this point. Perhaps 5 or 6. Are you writing the next one right now? How much longer will it be until the next book comes out? I don’t know. What will the title be? I don’t know that either. What cryptids will they find? I haven’t decided yet. Will Blackwood and/or Butch get punched in the face by Grace and/or Wolfe at least once? I don’t know, but he does deserve a punch it the nose at some point in the series. Just so you know that authors do “normal” things I’m writing this at “Danny’s Family Car Wash” where I’m getting my mother in-law’s car fluids changed so it does blow up when the drive back to the Sea of Cortez. I suppose that some authors wash their cars themselves and change their own fluids, but not this author. 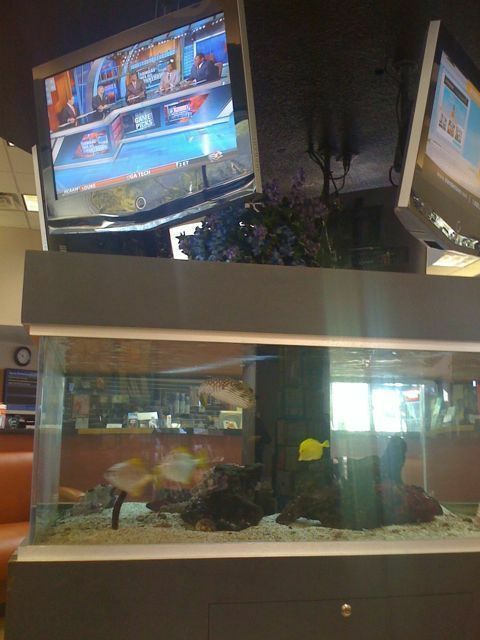 In the waiting the have sports on televisions and a salt water tank. I’m watching the fish. watching the action on the big screen. I couldn’t agree with you more. I think Cryptid Hunters and Tentactles would make a great film. But that is not up to me. It’s up to someone who makes films. I just write books. Most of my novels have been optioned for film, but that doesn’t mean they’ll ever be movies. Perhaps someday.